In the forum recently, Joan asked if I had any healthy food combination charts. Now, that raises a bunch of questions about the state of your health. I’m wary of recommending specific food combinations in general terms, because what improves health for one person, might have little or no effect on the next. However, when I looked for some relevant research, I found an interesting summary of several food combinations that have been shown to have real health benefits. 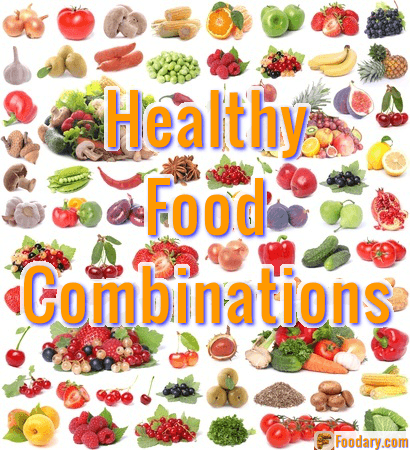 That summarizes 13 healthy food combinations. Unfortunately, the examples are not always linked to the correct research. I am investigating each claim in detail to find the latest science. I’ve also found some additional research pointers that indicate more potential. For today, I list the combinations from the aforementioned summary in the chart below. I will return to each combo for specific articles another day. Almond and Yoghurt Vitamin availability Healthy fat such as full fat yogurt and other dairy foods help activate and absorb essential vitamins. See Healthy Fat-Soluble Vitamin Combinations. Apple and Chocolate Cardiovascular Quercetin from apples combined with catechin from chocolate loosens clumps of blood platelets. See Food Combination Charts: Just Say No. Red Meat and Rosemary Reduced cancer risk Antioxidants from rosemary reduce cancer causing free radicals from charred red meat. Please note that at least one of the combinations in the summary article is wrongly attributed. I am only repeating the claims made in the report linked above. As I investigate each combination further, I will make corrections and notes as appropriate. Though I would normally vet all claims before publishing this type of summary, I see this as a good opportunity to raise discussion about these issues. That shows me which are the most important health issues to you. Having seriously investigated the first two claims, I am left with the feeling that food combination charts are, at best, a gimmick, and at worst, a dangerous distraction. It might be that rare cases of ill health justify specific personal food combination investigation. If you feel you might fall into that category, please discuss your case in the healthy eating forum, linked below.